EmpowerBus works to empower and employ local residents by providing reliable transportation and helpful skills for the workplace. 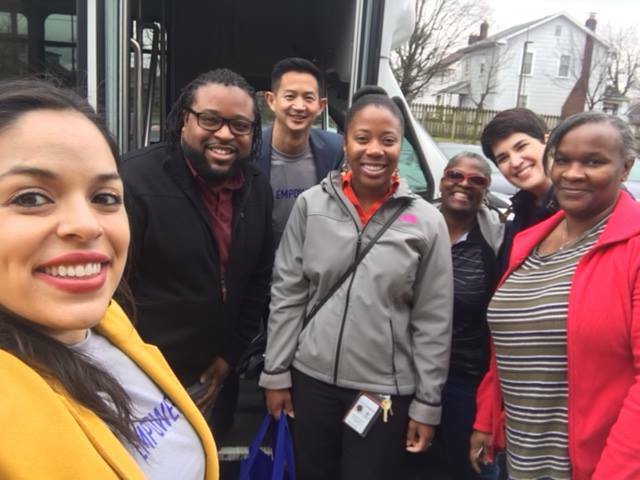 Providing Central Ohio with reliable and on-time transportation to and from work, education-related occurrences, and healthcare opportunities, EmpowerBus utilizes strategic partnerships to address the transportation barriers facing struggling communities. The average commute time in Ohio is around 20 minutes, however, for individuals who rely on public transportation, this commute is significantly longer and requires several different bus stops. Schedule flexibility is necessary when riding public transportation, as buses often run off schedule. EmpowerBus CEO and Founder, Aslyne Rodriguez saw this weakness in public transportation as an opportunity to strengthen community development and help employ and empower individuals in need. EmpowerBus works with partners throughout the community to find individuals who live near each other and are ready for entry-level employment. 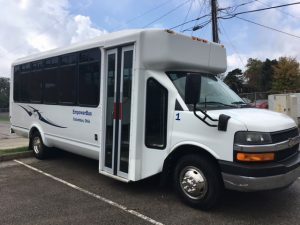 Once these individuals are found, EmpowerBus provides reliable transportation to and from work and when necessary, teaches riders helpful skills in the workplace. “The inspiration came from a dream I had about a yellow school bus,” Rodriguez laughs. Jerry Tsai, Empowerbus cofounder and president, and Rodriguez affectionately referred to this bus as the Magic School Bus. “The EmpowerBus idea started out as reinventing school buses, but eventually turned in a workforce transportation solution,” Rodriguez adds. The leadership team at Empowerbus is composed of Rodriguez and Tsai who both have more than 10 years of experience in nonprofit organizations. Before starting EmpowerBus, Rodriguez worked with Teach for America and was a Chief Operating Officer for Women for Economic and Leadership Development. Similarly, Tsai worked with Teach For America and was Vice President of Acceptd, an arts-focused start-up in Columbus. In the future, EmpowerBus looks forward to growing their business and impacting more lives in the community, while doing their part to improve the economy. To learn more about EmpowerBus, click here. You can also “like” them on Facebook or follow along on Instagram.